Some frequently asked questions – answered! It’s totally free! You won’t pay a cent for any incoming faxes. Setup and management is also absolutely free, and there are no hidden costs whatsoever. How many numbers am I eligible for? As many as you need. Registering and using numbers is also absolutely free, and you are not limited to any particular amount. Do I need to download and install any special software? None at all. All you need to do is register a number, to which faxes will be directed. 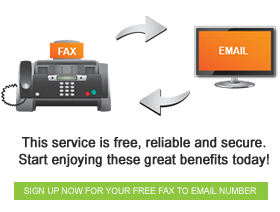 The fax to email service will then convert that to the correct format and instantly send it to your inbox. Can I send multiple pages? Yes, you can. The text in the body of your email will become the cover page of the fax and any attachments will make up the subsequent pages of the fax. Where can I receive my faxes? As long as you have a computer, laptop, tablet, or mobile phone, and access to the internet, you can receive your faxes from anywhere in the world.